The former London Wine Bar ("America's First Wine Bar") space in the Fugazi Building has a new tenant: ~GEORGES~. I had a chance to catch up with co-owner Elias Bikahi (Nook, Caffe Sapore, Sapore Catering, and he started Valentina), who is partnering with Leo Lippi on the project. Come August or so, the 55-seat restaurant will be open and focused on serving sustainable seafood, including a raw bar up front, plus local produce, and other sustainably raised ingredients (the partners have a close relationship with a family fish market and numerous farms). The menu will feature clean and simply prepared dishes with Mediterranean flair, like house-cured sardines, fish and chips, calamari, plus free-range chicken, and a variety of seasonal vegetables. The owners want the business to be as green and sustainable as possible, whether they are crushing the oyster shells from the bar for use as fertilizer for the farms they work with, to only offering house-filtered water instead of bottled. Of course all the interior materials will be reclaimed and recycled, too. Lunch and dinner will be served Mon–Fri, and perhaps Saturday service will start later. They are discussing launching a sherry club during the afternoon (between lunch and dinner service). There will be a full bar, and around 70 wines. As for the name, it looks like there were a lot of Georges in the family, so the name is an homage to them (although it's meant to be pronounced like the singular French name of "Georges"). Will let you know more, like the chef and specific menu items as it gets closer to the opening. 415 Sansome St. at Sacramento. Some changes in the Tenderloin: ~FISH & FARM~ not only has a new chef (Jake des Voignes is out, Chad Newton, recently of Urban Tavern and Baraka is in), and therefore a new menu, but there is also a refreshed interior. Oh, and a new menu format. Basically, what you see pricewise for all appetizers, entrées, desserts, and beverages is what you get: no healthy SF charge, no tax, no need to tip. (It'll be kind of like Europe.) Restaurant employees will still receive tips because the restaurant's computer automatically backs out an 18.5 percent gratuity, as well as taxes. Newton's menu will continue using local, seasonal ingredients, and he will also be able to maintain the relationship that he started at Baraka with Blue House Farm of Pescadero to exclusively supply the restaurant with its produce. On the menu: the pole bean salad I loved at Baraka ($11), with crispy shallots, marinated sweet 100 tomatoes, and dill crème fraîche; country pork chop with house-made cavatelli and cheese, farm chard, and Worcestershire pan sauce ($22); baked rigatoni ($20) with tomato-braised lamb and house-made ricotta; and Southern-fried Petaluma chicken ($20) with vinegar slaw, mashed potatoes, Gracie's cornbread, and Tabasco butter. For dessert, there is cheesecake in a jar or a Bi-Rite Creamery ice cream sundae (both $10). 339 Taylor St. at Ellis, 415-474-3474. Over in the Western Addition, after two years as a Nepali restaurant, ~METRO KATHMANDU~ is going through a re-concepting. The restaurant will close starting Saturday July 4th, and will reopen in mid-July with a new chef and menu, serving California cuisine. I'll have more details in the coming weeksâ¦ But for now, go get your last order of their delicious momos while you can (I requested they keep it as a secret off-the-menu item). The wine list will continue to be affordable, and look for a revamped weekend brunch as well. 311 Divisadero St. at Page, 415-552-0903. Many regulars at the Latin-American Club, Revolution Café, and the Make-Out Room are familiar with the Girl from Empanada, AKA Paula Tejeda, who shows up with a basket of homemade empanadas during the weekend (she bakes them at her shop, Chile Lindo Empanadas at 2944 16th Street and Capp). In a couple weeks, she is going to be set up inside the now-closed Minimum Wine and Champagne Bar next to Esperpento. She is repainting and making changes to the tiny slip of a space, and will reopen it as ~CHILE LINDO EMPANADAS AND ESPERPENTO WINE BAR~ in a couple weeks or so. You'll be able to enjoy a glass of wine over one of her classic pino empanadas (onion, cumin, paprika, beef, hard boiled egg, raisins, and one black olive), and the "chilanga" vegetarian version made with cheddar and mozzarella cheeses and jalapeno. They're big and filling empanadas, at only $5 a pop. Hours will be Thu–Sun 6pm–midnight. (The 16th Street location will continue to be open on the weekends.) If you'd like to read more about Paula, Thy Tran wrote a nice piece about her on Bay Area Bites here. 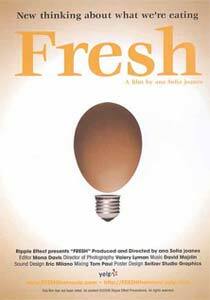 3283 22nd St. at Bartlett, 415-850-4778. So a few weeks back after the Meals on Wheels event, there was a big goodbye party at ~YUET LEE~ for the affable Timmy Yu, who has been there since 1977 (interesting fact: it was the first Chinese resto to open on "that side" of Broadway, which back then was "the Italian side"). No idea what Timmy is up to next—he's on a much-deserved three-week vacation at the moment. Industry people, take note: one unfortunate change is Yuet Lee's awesome late-night hours have changed. It's now closing at midnight on Sunday and Wednesday–Thursday; the 3am closing time only applies to Fridays and Saturdays now. That's the problem with late-night places—if you don't support them, the hours go away. 1300 Stockton St. at Broadway, 415-982-6020. Partners in Beretta, Deborah Blum and Adriano Paganini, have taken over the ~ASQEW GRILL~ space in the Castro, and have brought on Adam Timney (bacar, E&O, Boccalone) as the chef. Look for a casual place (the project doesn't have a name yet) serving California comfort food, with a few dinner entrées and pizzas, plus salads, sandwiches, vegetable dishes, and cured meats, plus weekend brunch that will be served all day (a bonus with its sunny patio—although don't pick any herbs from the herb garden that will be back there, you troublemaker). Lane Ford (Beretta, Heaven's Dog, Flora) is heading up the bar program, but since there's no hard liquor, you'll find some creative juices and herb-based options instead, plus 30 beers, beer cocktails (like micheladas), and wine with a domestic focus. The 100-seat restaurant will open in fall 2009, and Jim Zack of Zack / deVito Architects is the architect. 3583 16th St. at Market. And now let's clear up some rumors about some of the big places around town. First, there has been some buzz about what is going on at ~FIFTH FLOOR~—I heard rumors of closure (this town looooooves to talk), but fortunately those are just rumors. What has happened is GM Todd Stillman was laid off last week—Scott Stewart, the AGM, will now be moving into more of a restaurant management role. Since the bar business seems to be a popular one during these leaner times, Fifth Floor has brought on Jacques Bezuidenhout to focus his attention on the bar program—I'll have some news about his new cocktails (featuring herbs from the garden) plus some cool things Emily Wines will be doing with the wine program in coming weeks. 12 4th St. at Stevenson, 415-348-1555. I've also heard plenty of doozy rumors about the fate of ~MICHAEL MINA'S~ restaurant on Union Square, ranging from BCBG taking over the space, to a relocation, to the restaurant shuttering because its lease was up (here's one blog speculating on some of the possible changes). Now, true, the lease was up for review and negotiation with the hotel (Westin St. Francis/Starwood Hotel Group) and union. Since there is now a new agreement acceptable for all, it's business as usual, well, not exactly as usual since they have seen a 22 percent decrease in volume, but there is no relocation happening. Here is the official statement from Michael Mina: "The partnership with the Westin St Francis Hotel has been incredibly important for the restaurant. We've worked very hard with the hotel and union partners these past months to reach and sign a new agreement which makes it possible for the restaurant to remain in the existing space. We couldn't be happier with the outcome. It's been a wonderful space for us. "The restaurant industry has been hard hit by the recession and economic realities we are in and adjustment and creativity are necessary to keep afloat and stay successful. Although the restaurant has been affected by the times, as we've all felt, it is doing well. We've seen continued success through maintaining a strong, core staff and offering guests new ways to dine at MICHAEL MINA. I am optimistic that as an industry we'll turn the corner in this economy, but success will be determined in part by our ability to respond to the needs and realities of our patrons. We welcome our guests to continue to join us not only for special occasions, but for everyday great values." More in the hard-hit fancy land: so now the Sunday brunch at the ~RITZ-CARLTON SAN FRANCISCO~ has been relegated to Saturday and Sunday breakfast in The Lobby Lounge, and Saturday and Sunday lunch in The Dining Room, effective Sunday June 13th. Specialty holiday brunches will continue to be offered for Easter, Mother's Day, Father's Day (see the socialite for news on this year's Father's Day event), Thanksgiving, and Christmas. I really hope when things get better (and dammit, they will), that the brunch returns soon, because I have fond memories of some Sundays on that patio. 600 Stockton St. at California, 415-296-7465. Some changes over at ~ORSON~: while many places are cutting back or eliminating lunch service, Orson is actually starting lunch service this Wednesday June 10th, and then running it Tue–Fri from 11:30am–2:30pm. There are a lot of SoMa workers who are sure to appreciate a menu of pizzas (five kinds, $12–$14), plus a fried chicken sando on a Parmesan bun ($8), fish tacos ($9), and the Orson burger ($12). There will also be some grab-and-go sandwiches, like shaved house-made Wiltshire Sides/Canadian Bacon (more like smoked ham rather than a brunchy-eggs Benedict version) with pickled onions and mustard on Josh's sourdough rolls; and egg salad with celery and dill. 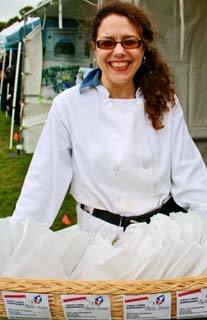 There is also a new FOH manager, Kristen Capella, whose background includes Horizons in Sausalito and La Folie. Also look for a Bind boutique (the clothing line Sabrina Riddle is behind) to take over the kiosk area. 508 4th St. at Bryant, 415-777-1508. A tablehoppin' Polk Street reader pointed out a Moroccan restaurant named ~AICHA MOROCCAN CUISINE~ is up and running in the former De Afghanan Kebab House space. MenuPages has a PDF of the menu (albeit an upside-down one), and a few Yelp reports can be found here. 1303 Polk St. at Bush, 415-345-9947. Over in Fisherman's Wharf, two tipsters let me know a sign says ~MIYABI~ is moving into the former Bob's Sushi place (which, according to a link from a Yelper, it looks like Bob's used to buy black-market abalone, so good riddance). 393 Bay St. at Mason. tablehopper reader James S. wrote in with this news: "~GRANDEHO'S KAMEKYO~ in Cole Valley has a new owner. Long-time employee and sushi chef Byron bought the business and has taken over. He's a great guy originally from China and he cooked for five years in Japan before coming to the States." 943 Cole St. at Parnassus, 415-759-8428. Are you a carb lover? Uh huh. Starting tonight, June 9th, ~QUINCE~ is adding a special pasta tasting menu, featuring traditional Italian pastas along with chef/owner Michael Tusk's modern interpretations. Five courses for $50, and wine pairings for a $35 supplement. Sample menu items include: Senatore Cappelli spaghetti (Manila clams, melon, and espresso); tortelloni of watercress (Bellwether Farm ricotta cheese, calendula, and chive); egg tagliatelle (salsa di porcini, squash, and their blossoms); bittersweet chocolate gnocchi (duck polpettine, eggplant, Chelan cherry, and smoked sea salt); and lasagnette (Tomatero Farm golden raspberry sorbetto and fino verde basil meringue). Now, those are some flavors I gotta try—vewy intewesting. 1701 Octavia St. at Bush, 415-775-8500. 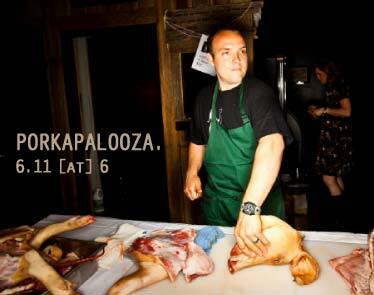 Another week, another pig: Ryan Farr from 4505 Meats and Taylor Boetticher from Fatted Calf will be doing a pig butchering demonstration and party called Porkapalooza on Tuesday June 16th at ~BLOODHOUND~. There is a 250-lb. Duroc pig from Good Farm that will end up on the BBQ, plus there will be pulled-pork sliders, homemade corn dogs, and hot dogs with all the fixins, chicharrones, and an assortment of Taylor's fine meats and pates. This is also your chance to try bacon-infused bourbon in a custom Old Fashioned. The cost is $30. Buy tickets here. 6pm–10pm. 1145 Folsom St. at 7th St.
Been reading about ~FORAGED FOODS MEALS~? (As in found and real, not forged, har.) There are two coming up from The Wild Kitchen on Sunday June 14th (East Bay), and Thursday June 18th (Mission). Dinner is $40, and $10 reservation tickets can be purchased at brownpapertickets.com. All dinners start at 8pm, and the exact location will be sent out the day of your meal. Sushi falls a bit into the luxury category right now (unless you're eating lousy stuff from the grocery store), so you should definitely consider this promo: 15 pieces of sushi for $15 during the Lucky 15 at ~KYO-YA~. It happens on the 15th of June and July during lunchtime (11:30am–2pm). You can get your 15 pieces to go, but if you dine in, you get a complimentary Ichigo lemonade. Check out the flyer here. Reservations requested. 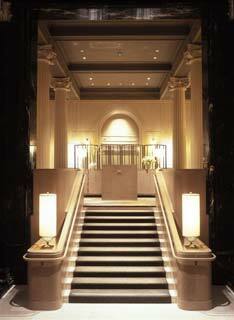 Palace Hotel, New Montgomery St. at Market, 415-546-5089. I also heard ~MOMO'S~ has a New York steak three-course dinner deal: for $29, you get your choice of soup or iceberg wedge salad, a 14-ounce New York steak (center cut, dry-aged for 21 days), some daily sides, and a chef's selection for your dessert. 760 2nd St. at King, 415-227-8660. For all of this week (through Friday the 12th), downtown's ~URBAN TAVERN~ has announced a limited time "pay what you think it's worth" promotion to launch executive chef Mary O'Neill's new summer lunch menu. Diners can eat up to a three-course meal and then pay what they think it's worth. There's room for 100 diners per day, and you have to make a reservation. Lunch can include food, soft drinks, coffee, and tea, but no alcohol. The existing offer of five hours of free parking while dining will also be valid during this time. 11:30am–2:30pm. 333 O'Farrell St. at Mason, 415-923-4400. Since we're talkin' parking, did you know that ~SOUTH~ has struck a deal with the Bank of America parking lot? (It's the one behind South on the corner of Fourth & Brannan.) South customers are entitled to $5 parking Mon–Sat from 5pm onwards, even on Giants game days! All you have to do is call South for the code and then keep your South receipt. Suh-weet. Now you can apply all that money you saved to something you can actually taste: Aussie eats and vino. 330 Townsend St. at 4th St., 415-974-5599. Would you be happy with some free ice cream? Of course you would. On Sunday June 14th from 1:30pm–3:30pm, you can ~GET A FREE SCOOP~ of a Dreyer's MAXX flavor (not available in retail stores) and a mix-in. Flavors include: Chocolate Peanut Butter Chunk, Java Mash Up, NESTLÉÂ® DRUMSTICKÂ® Cone, or Chocolate Cookies 'N Cream Collision. It all goes down at the Dreyer's PIER 39 Scoop Shop. Embarcadero St. at Beach. Last week I mentioned the upcoming ~SUMMERTINI~ event on Friday June 19th, and for those of you in an auction frame of mind, I wanted to give you a sneak preview of some of the items on the auction block: you can dine with Michael Bauer in the "Critic Review Dinner" lot, dine with a guest at the chef's table in Chez Panisse's kitchen (plus stay overnight at Joie de Vivre's nearby Hotel Durant in Berkeley), and more. Check out all the lots and purchase your tickets here. ~FARMERS' MARKET~ news: this last Sunday, the one that started in the Inner Sunset was a hit, and if its success continues, it should be running until November 22nd from 9am–1pm on Sundays. It's in the parking lot between 8th and 9th Avenues and Judah and Irving Streets. And then in the lousy market news department, Eater broke the story that "some of the most popular vendors from the ~ALEMANY FARMERS MARKET~—including All Star Tamales, El Huarache Loco, Estrellita's Snacks, and Sabores del Sur—have been given notice that they will be booted at the end of the month." Uh, a lot of people go to the market just for their food, hello! Read more about the RFP brouhaha, and here's a petition you can sign in an attempt to keep these vendors in their spot at the market here. 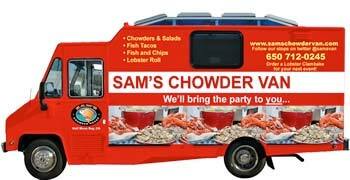 San Francisco isn't the only one with a bunch of street food news: Sam's Chowder House in Half Moon Bay is starting the engine of ~SAM'S CHOWDER MOBILE~, which will be hitting office parks in the Peninsula (like Oracle, etc. ), and a variety of upcoming events. A year in the making, this lobster-red mobile seafood shack will be serving Sam's delicious Maine lobster roll (my mouth waters just thinking about it), plus fish and chips, crab Louie salad, clam chowder, and fish tacos (all made with sustainably-fished seafood), as well as key lime pie for dessert. Prices range from $4.95 for a fish taco or 16 oz. bowl of Sam's famous clam chowder, to $9.95 for fish and chips to $14.95 for Sam's lobster roll. Lunch and dinner customers can find the Van's current location by following it on Twitter @samschowdermobile, or by visiting samschowdermobile.com, where there will be a live Twitter stream describing the Van's current location, plus there will be a live events calendar where you can find the Van (like the Santa Clara County Fair). You will be able to hire the van for private events, and even hold lobster clambakes. The cooking oil is recycled, and all packaging and utensils used on the Van are 100% biodegradable and compostable. Beep beep! Now for some East Bay news: according to a press release, "Christopher Losa of Bar Bambino is opening a new project in Oakland's Jack London Square Marketplace. Currently the project only has the working name of ~DELICATESSEN~, which is more a reference to the overall concept. It will be a retail shop and cafe focusing on artisanal food and drink. Celebrating the best of the best, cheese, wine, craft beer, distilled spirits, cured meats, and prepared foods will be sourced from around the world and in our own backyard. For this project Losa is stepping beyond Italy and looking globally to bring together a collection of culinary treats. Additionally some special relationships are being cultivated to showcase exceptional hard-to-find products. All involved will be working hard to open late winter, early spring 2010." 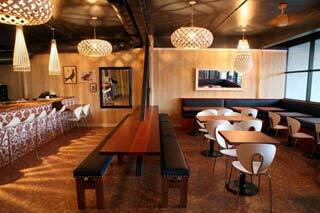 Also heard chef Alex Marsh of ~LEVENDE EAST~ is no longer with the restaurant. Taking his place is his sous chef, Ron Miranda. This little party seems downright irresistible: Frog Hollow Farms will be in the house at ~SOLANO CELLARS~ on Thursday June 18th. They'll be offering up the season's sweetest Bing cherries, Golden Sweet apricots, and Gold Dust peaches for sampling along with some of their conserves, dried fruit, granola, and olive oil. Kirstin (Solano Cellars' resident wine bar manager and cheese aficionado) will pair some tasty cheeses and pour wines by the glass at the bar. No charge to attend. All food samples are gratis. If this event generates enough interest, Solano Cellars will become a Frog Hollow CSA (Community Supported Agriculture) drop-off point, and neighbors will be able to pick up boxes of fresh produce at their shop each week. 5:30pm–7:30pm. 1580 Solano Avenue B at Ordway, Albany, 510-525-9463. Tomorrow night, Wednesday June 10th, ~BRAVO'S TOP CHEF MASTERS~ starts at 10pm. 24 renowned chefs will be competing for charity. The first show kicks off with Hubert Keller (Fleur de Lys), Christopher Lee (Aureole), Michael Schlow (Radius Restaurant), and Tim Love (The Lonesome Dove Western Bistro). Other local chefs competing on the show will include Elizabeth Falkner, Michael Chiarello, and Cindy Pawlcyn. Check 'em all out here.